The second revision of NSRF 2014-2020 took place at the end of last year with a view to rationalizing the program and integrating (or removing) projects according to their maturity. Ypodomes.com published a special list for these projects, starting from the railway, who are the new priority in the country's construction sector. 1. Construction of a new double-track railway line with modern technical specifications, ensuring the interoperability across the network, such as the construction of the upgraded railway sections between on Athens-Patras corridor: Diakopto-Rododafni and Rio-Patra, which will interconnect the port and the city of Patras with Athens and the Freight Center in Thriassio Plain. 3. Upgrading of the existing single-track railway line with electrification systems on Thessaloniki-Promahonas (Bulgarian borders) corridor. It is a part of the Eastern Mediterranean/Eastern Mediterranean/East-MedCorridor Multimodal East Corridor Project, as well as the upgrading of Thessaloniki-Edomeni railway line, which is the country's second cross-border railway access. 4. Upgrading of the railway connection of Thessaloniki Port Pier VI with the main railway corridor (PAThE/P). 5. Installation of modern signaling and telecommunication systems in selected sections of the railway network, completing the upgrade works on Athens-Thessaloniki corridor. 6. Construction of a new double-track railway line in Rododafni-Rio section (to Patras), including superstructure, electrification and signaling works. 8. 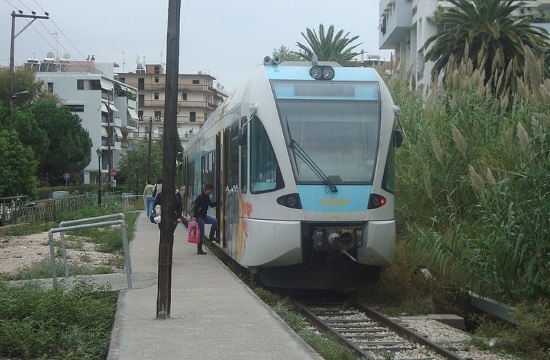 Suburban railway connection of Loutraki to the main railway axis, as well as other connections (e.g. industrial zones, ports, etc.). 9. Connection of Kilkis Industrial Area (Central Macedonia region) with the main railway axis. 10. Connection of Alexandroupolis Industrial Area (EasternMacedonia and Thrace region) with the main railway axis. 11. Upgrading of SKA (Acharnes)-Oinoi railway section, which will improve the technical characteristics and funcionality of the country's main railway axis. 12. Upgrading of Piraeus-Athens-3 Bridges railway section, Athens Central Railway Station (connection with Athens Metro), which are necessary infrastructure works that will improve day-to-day traffic conditions of the residents of Attica. 13. Operation of West Thessaloniki Suburban Railway. 14. Upgrading of the single-track railway line between Paleoparsalos and Kalambaka (electrification and signaling works).